Being a freelancer has its ups and downs. One of the ups is that you can have a mid-week break from reporting on the effects of the financial crisis on a small European country and cook lunch for a friend who lost her job because of the very same crisis. As she is one of the most cheerful people I know, I decided to make an equally cheerful savory tart, with tomatoes and grilled eggplants topped with goat’s cheese. It was accompanied by one of my favorite salads – Lebanese tabbouleh, to bring the spring back to our recession-ravaged lives. By now I’ve learned how to navigate my sorry excuse for a kitchen and on that sunny March morning even the temperamental gas oven wasn’t a match for me. Tart crust is easy if you don’t panic, and is ready in a breeze. This tart calls for a pre-baked shell so you can make it ahead of time. I used small Sicilian eggplants, which are extremely beautiful with their light purple and white stripes. I don’t salt the eggplants and don’t wait for 20 minutes when they don’t have many brown seeds – it’s a waste of time. The bitterness is in the seeds. The tomato sauce I use for pizza and spaghetti with meatballs, which I usually make in batches and freeze afterwards, made the whole operation faster. I wish I could have served it all with a crisp and fruity Portuguese Vinho Verde, but didn’t have time to get any that day. For the tart crust see my cranberry tart recipe. Keep the remaining part of the dough in the freezer for future use. Preheat the oven to 400°F (200°C). Pierce the shell with a fork to keep the crust from rising. Place aluminum foil on top of the tart shell, weigh it down with dry beans or tart weights if you have some and bake for 15 minutes on racks positioned in the middle. Remove the foil and bake for another 15 minutes or until the shell is golden brown. Take out and leave to cool. Preheat the oven to 400°F (200°C). Heat the oil in a heavy-bottomed frying pan over medium heat, add the eggplants in batches if they don’t fit in single layer and saute until soft and slightly brown. Transfer to a plate covered with a paper towel to soak up the extra oil. Sprinkle with salt and pepper and toss. Spread the Dijon mustard over the bottom of the tart – it gives a nice sharp bite to the sweet tomato-and-eggplant filling. Spoon in the tomato sauce and spread it evenly. 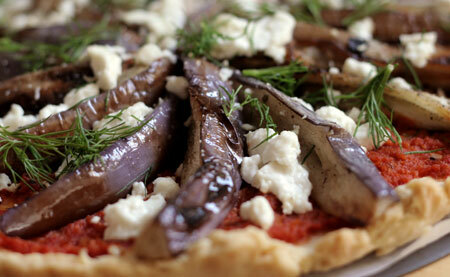 Arrange the eggplant strips in a fan (or if using rounds – starting from the outside lay them in overlapping circles). Crumble the cheese on top, sprinkle with more black pepper and bake for 10-15 minutes or until the cheese starts melting and the eggplants are warmed through. Serve warm with a salad and a nice crisp white wine. It will really make a difference to your mid week or light weekend lunch.